2019, the year of Alex Gaskarth and Mark Hoppus, such a great super duo am I right? Maybe even greater than Batman and Robin! For those of you not “in the know,” the All Time Low and blink-182 front men formed a side project that goes by the name Simple Creatures, and they released a song called “Drug” about a week ago or so, and it got a rather mixed impression from both sides of the fandom, which is to be expected. Those “na na na’s” aren’t for everyone obviously. So, is “Drug” a missed opportunity that some like to think it is? Or, are these pop punk aficionados just having some good old fun on the playground while their classmates are taking a grueling math exam? Let’s find out. When clicking play on “Drug” inside of Spotify, only two words come to mind: MINDLESS and FUN. The two most perfect words to describe listening to “Drug” about one hundred and six times in the span of about a week, and it’s funny, I’m still not tired of it. Simple Creatures’ Alex Gaskarth and blink-182’s Mark Hoppus might not be changing the musical echo chamber with their latest single, but it’s damn good fun to listen and sing along to which each repeat listen, even if you’re someone that hates the fun-filled stream of “na na na’s” present in the track. The instrumentals featured in “Drug” aren’t earth-shattering, and won’t give you the supreme pleasure you might be able to give yourself, but not every song in existence needs to be Beatles-level quality instrumentally. The subtle, yet simple instrumentals don’t overly try and complicate, which could have ruined the relaxed and natural flow of the always fiery All Time Low front man who provides his own sour punch vocal performance, while coupling way too nicely with the human-formed Energizer Bunny that is Mark Hoppus. Alright, to be honest, vocally both men have seen better days, and at times “Drug” might come off a bit too safe, which is a shame as I’m hoping both men have a lot more to showcase in the months ahead when it comes to experimentation with this specific project. It’s not every day you have Alex Gaskarth and Mark Hoppus making sweet love in the form of music. But, if one thing is as clear as day, it’s that both these pop punk juggernauts are having way more fun than I’ve heard them have in their own respective bands in a good while, and that’s great. 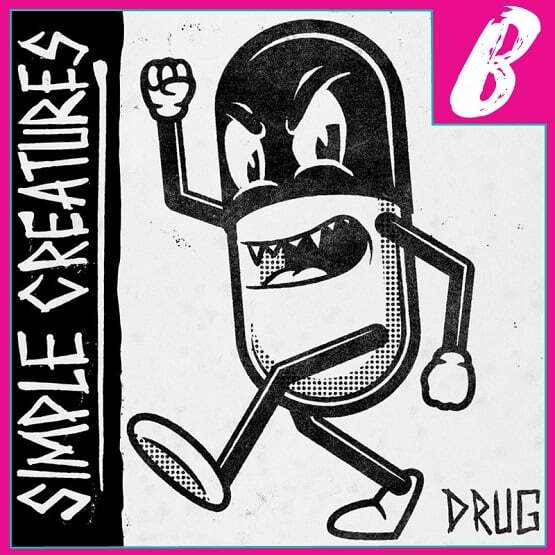 Simple Creatures’ latest single “Drug” might not be a contender for “Song of the Year,” but that’s the thing, it’s not trying to be. “Drug” is a wonderful tease for what’s to come when Simple Creatures unleash their debut six-track EP, Strange Love which is looking towards a March release date. Will I enjoy every song that Simple Creatures release? Probably not, but I don’t like every single blink-182 and All Time Low song either. But, I do enjoy “Drug,” and I’ll continue to keep it playing until they release the next one.